Closet shelving has developed into a science, but not rocket science; nobody is curing cancer with their closet technology. Closet companies are simply cutting and edge banding melamine particle board, or shearing and capping wire shelves (please see Product Descriptions below). When shopping for a closet system look at design, product quality, installation practices, customer service, warranty, and price. Every closet lends itself to certain layouts which “flow well”. Guidelines used to generate and fine tune a design for a given closet start with the needs and desires of the client, followed immediately by wall dimensions. Closets can also be of reach-in and walk-in style. Bedroom walk-ins are a primary concern for most customers. Proper tower locations and allowance for adequate hanging space in the right places and the correct heights lead to a sleek, functional design for a master suite. Shoe racks free standing or attached to the wall. Vertical panels come in various lengths (heights); with ClosetMaid they range from 12” to 80” for wall-mounted systems, and 85” and 96” for floor-mounted systems. Shelving comes with or without cam locks in lengths (widths) of 12” to 120”. Towers with drawers, hampers, As you can imagine, it is fun to do from design, to installation to squeals of delight. That is why we do it. Closet shelving is made of either ventilated wire or melamine laminated wood. High quality is derived from having a quality manufacturer like ClosetMaid™ supplying us with melamine and wire shelving components as well as a myriad of accessories and storage gadgetry to address every need. Melamine refers to particleboard with a ‘thermofused’ paper coating which is available in traditional white as well as many other colors and simulated wood grain finishes – Antique White, Maple, Warm Cognac, and Mahogany. Please see our Gallery for more. Ventilated wire shelving has two great features – affordability and flexibility: 1.) Affordability, mostly because every thing is basically horizontal (there are no vertical components except support braces and poles) and 2.) Design flexibility allows freedom to arrange shelving and hanging sections pretty much as you please. Of course, we highly recommended you allowing us do everything, mostly because it’s our core focus and we have the knowledge and experience to do the work correctly the first time around. Not to mention the benefits of our volume pricing, one day installations and warranty. You could purchase shelving and hardware to install yourself from the local home improvement store. While the shelving in the box appears economical, it’s the supporting hardware that is usually marked up dramatically. Be ready to spend about the same amount of money and make a few trips to the store for ‘stuff’. Enjoy your good learning experience, but please be careful. The learning curve is short but steep for this type of work. Know what you are drilling into. Use common sense when spacing supports and clips. No one should get hurt physically or economically redoing a closet. Call us if you need help. We not only pass along these savings to our customers, but do so where our work is most effective – in your home. 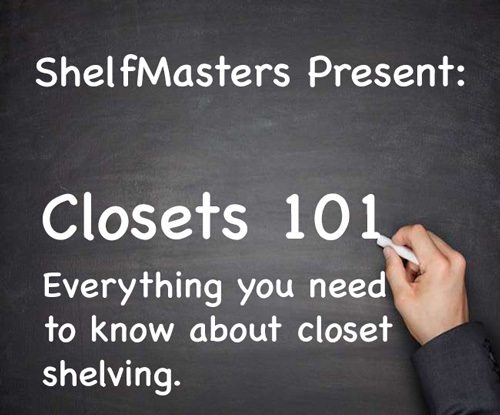 Closets are getting larger – period. Whether a redefinition of an existing space, or penciled in the building plans of a new build, industry analyst cite that closet upgrading is not only a beneficial home improvement, but also an intelligent investment proven to have impact on a home real estate value.